The mystical month of the Ivy Moon began on the 13th October 2015 with the calm and balancing energies of the Libra New Moon, will peak at the end of October with its Taurean fullness and Samhain falling close together, and will end for those of us in London mid November with a visit from the Divine Mother of Immortal Bliss. The harvest is over, now comes the time to prepare ourselves for the transformative energies of Samhain and the coming Winter. During the Autumn, Water is the underlying elemental force, teaching us to flow, to feel, to share, to care. 2015 has been for many an intense year of growth and new openings – the pace of change gets calmer now and we are able to slow down too and feel where our souls are at. What is it we need to do to prepare for Winter? What is it we need to do to integrate the changes within ourselves into the bigger story of the journey of our lives? At the Autumn equinox a sudden shift from the background fire energy of Summer and earthy practicalities of Virgo Sun month into the autumnal Water vibration plus the air of Libra Sun, can come as a shock to the system. We seem thrown off balance, and many of us get sick as a result, but in fact we are catching up with what is needed to create a new balance. A few weeks into the month we should have mostly adjusted to the new vibrations, mourned the loss of Summer and be open to the magical, colourful, and more restful, Autumn. Samhain is coming – the Pagan new year when themes of death and rebirth are strong. This is a powerful time to celebrate the Great Mystery of our existence, to open our souls to spirit, love and guidance from the non-physical realms… to open ourselves on the inside to the many layers of light and dark within, journey to our spirit guides and god/goddesses for insight and healing….. and permit any parts of ourselves that are no longer serving our joy and evolution to die. Samhain is the time to celebrate those who have passed out of our world, to open to them in love and feel their continued presence in our lives. This will bring us reassurance, resilience, reflection and respite. Life is eternal, and although we are experiencing it from the perspective of our individual body-minds, we are not those bodies, we are not those beliefs, thoughts, desires and fears. We are life itself. Facing death and overcoming our fear of death is how we get to experience this truth for ourselves, to take it deep inside and become it. Mata Amritanandamayi, AMMA, the Mother of Immortal Bliss is on her European tour this month. She always comes at this time of year, when soul energies are at their strongest and the universe wants our attention. 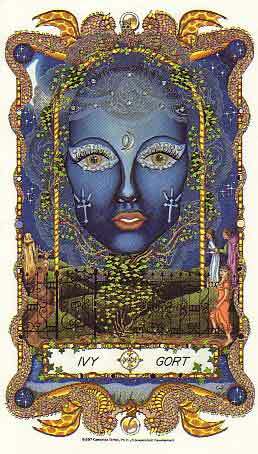 At the end of this ivy moon journey she will be giving darshan, divine blessings, at Alexandra Palace in north London. Anybody making the transition from the ego mind to the eternal light is recommended to go. Amma is the first guru in history to dispense divine love through a hug. She embodies the unconditional love and compassion of the Divine Feminine. She comes to empower us to walk our path confidently and embody it also. Her tradition is a hard-core philosophical school of non-dual awareness. This is something the Hindus have been trying to teach the west about since the 19th century – my impression is that the ‘elite’ of the west got the picture a long time ago (they were already practising magical awareness through their secret societies and rituals after all) and have used that knowledge to keep the rest of the population obsessively focussed on war, work, consumerism and competition ever since, and thus ignorant of the spiritual reality. Gradually however we are all in the process of waking up to the bigger picture. An urgent shift must happen for our species while there is still a planet to save. The Wheel of the Year, the wisdom of the Goddess can take us to the heart of who we are, to the core mystical truths of life on earth.